Discovering a Wildlife Refuge Through Art! | Art Sphere, Inc.
Discovering a Wildlife Refuge Through Art! On Saturday Feb 2, through Art Sphere Inc., I assisted teaching art in a wildlife refuge in my own backyard that I had not known about before. I have lived 8 blocks away from the the John Heinz National Wildlife Refuge at Tinicum for almost 12 years and was surprised by what I found. John Heinz National Wildlife Refuge was established in 1972 and is a 1000-acre refuge for wetlands that span Philadelphia and Delaware counties in Pennsylvania yet is also located next to the Philadelphia Airport. It protects the largest remaining freshwater marsh in Pennsylvania (350acres) and yet from the park you can see the city skyline. In addition to 300 species of birds, it has bats, turtles, fish, deer, opossums, red foxes, raccoons, coyotes, beavers, river otters, minks, woodchucks, and muskrats along with a wide variety of wildflowers and plants. John Heinz National Wildlife Refuge hosted a Groundhog Day festival to celebrate Groundhog Day and this was also my first time going to a Groundhog Day festival. It was very exciting for me to experience so much nature for the first time. The whole facility was decorated for Groundhog Day and I saw many brand new displays about native area animals and their habitats. Cara, Sarah and I set up our table with art projects to teach the importance of protecting animal habitats. At our table, we had different fun crafts for the adults and children to participate in. One craft was bookmaking with small origami booklets made out of a single piece of folded paper with pages so that kids could write and draw in. 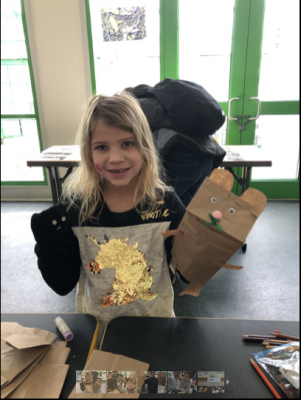 Another craft was coloring pictures of different native Pennsylvania fishes that can be caught at the refuge. 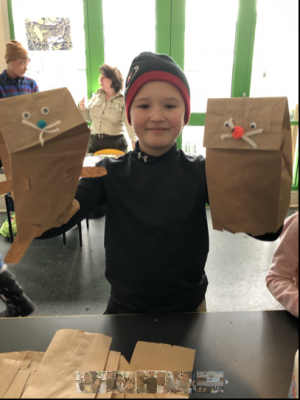 But, the most popular crafts was Groundhog puppets made out of paper bag puppets, construction paper, pipe cleaners pompoms, and googley eyes. We taught people to glue on the different parts of the puppet and they were free to decorate it however they wanted. We also talked and answered questions regarding Art Sphere Inc.. The kids were really proud of their work and there were even babies and toddlers that enjoyed coloring. There was even a blue goose, the refuge mascot, interacting with everyone that stopped at our table to make a craft. He made all the kids laugh by dancing and high fiving them. I got a high five from him myself! I enjoyed myself and it was nice to see all of the children and adults having fun making crafts with over 100 participants! Share the post "Discovering a Wildlife Refuge Through Art!"